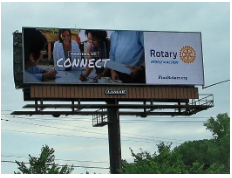 During the last quarter of the 2017-18 Rotary year District 5710 invited our Rotary District to participate in a joint Public Image Campaign to raise awareness and perhaps boost interest in membership in Rotary. Since our Districts split the Kansas City metro media market, it made sense to support the collaborate effort. The effort was initiated, planned and conducted by several Rotarians in District 5710, spearheaded by Pat O’Donnell the District 5710 Public Image Chair. Individual clubs and Districts 5710, 6040, 5670, and 5690 with a huge assist from RI, funded and monitored the campaign. All the media spots direct viewers/listeners to “ FindRotary.org ” RI Staff track the site and provide details on the number of leads received and which club they were referred to. While the results are yet to be tabulated, the spirit of cooperation and the pooling of resources reflect how Rotarians accomplish tasks. The following reflects the outlets utilized in the campaign. Video running on low-power tv stations covering much of the rural area within these districts. This also may hit some folks who have cut the cable cord. The same video is on the Topeka Capital Journal website.